Agile People is the concept of an agile mindset, agile values, principles and tools to improve work in a world where everything changes exponentially. When working in a company embracing the agile value structure you need to understand how people strategy, people operations & management need to change − regardless if you are a Manager or an HR professional. These two perspectives are just two sides of the same coin. How is the agile approach related to Lean and Systems thinking? What characterizes the agile mindset and values? How should people: recruitment, development, salary, performance-evaluation and rewards look like? Do we provide what people need to perform well? How can we make people take responsibility and feel a sense of ownership for their work, when everyone in the organization needs to be a leader? How can we use agile techniques like Scrum and Kanban ? What are the specific skills that we need to use to run an agile transformation, from a people perspective? How we can support an agile organizational transformation: You will learn how to assess the current organizational structure, and then get ideas around how to create a new structure that enables business agility, maximizes communication and collaboration within and among teams and enables the flow of value. How to set goals and manage performance in a new way: You will learn how to appraise current performance management practices and identify ways of bringing Agile thinking to enhance performance, accountability and growth through new goal setting tools like OKR:s.
How to handle Salaries and benefits in an agile organization: You will learn how to describe and contrast traditional incentive structures with Agile-friendly structures and discuss the pros and cons of each approach, explaining how you could apply them in your environment. How to develop an organizational action plan for role modeling an agile mindset: You will learn how to build new skills that will enable cross-functional teams based on T-shaped people. Job Roles – are they needed in the future? Employee engagement and motivation in an agile manner: We will recommend motivational tools to be applied in different contexts, and describe how the traditional employee engagement survey needs to change when we work with an agile value structure. Talent acquisition and the candidate experience: We will show how you can create a design and sourcing-strategy that can be used to find and acquire the “right” people to support the strategic growth of the organization, by taking values, culture, diversity and collaboration into the hiring decision. Why the agile mindset is everybody’s responsibility: We will show how to design the talent/people elements needed to help support an organizational agile transformation, and discuss the difference between ownership, responsibility and accountability. The needed changes in all functions: You will get to reflect on how the need for business agility affects your function and organization and how it impacts team members’ roles and behaviors. Practical tools, templates and exercises: You will learn how you can work with agile tools and methods, for example with Kanban, Sprints, Scrum and Retrospectives to increase people- happiness and performance. The workshop places great emphasis on practical examples and we will present a series of tools you could use when getting started on your own agile initiative. Please contact us for detailed information about upcoming workshops. In the footer of this page you will find our contact information. We have previously trained participants from SKF, SE-banken, Marginalen Bank, Nordea, Volvo, TetraPak, Tele2, IFS, If, Svevia, Helsingborg, Uppsala, Manpower, Evry, TV4, Vitrolife, Rebtel, magine, Toca Boca, Dynabyte, Södertörn University, DEK Technologies, Vasakronan, IKEA, Blue Garden, Nordic Morning, Findwise and many other companies and organizations. Evaluation of the last completed training ended up on average 4.83 on a 5-point scale. Line managers, HR business partners/specialists. Managers from support functions (e.g. IT, HR, marketing or finance). Consultant managers, general managers, management teams, consultants and more. 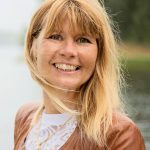 Pia-Maria Thorén, has 25 years of consultant experience from large Swedish and international companies for HR leadership and organization. She is the founder of the company GreenBullet and the global network Agile People. She is also the author of the book Agile People – A Radical Approach for HR and Managers (That Leads to Motivated Employees). As a consultant she has worked with many of Sweden’s largest companies and is a frequent lecturer at conferences and different types of networks. 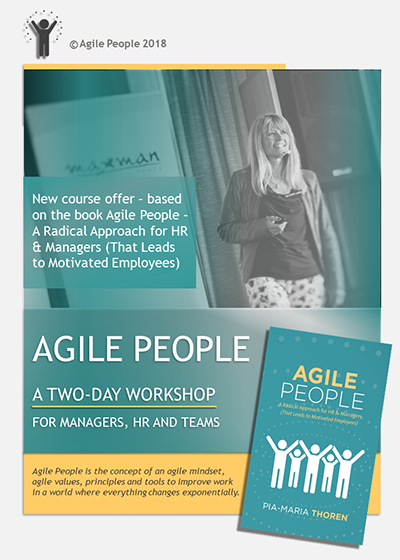 Agile People Workshop Coming soon!